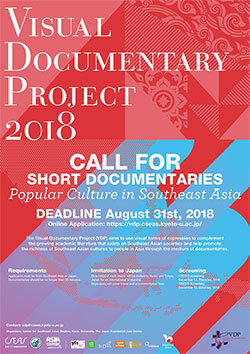 The Visual Documentary Project accepts documentary submissions from Asian filmmakers and, through film screenings, introduces them to a wider audience in Japan. The theme for this year is “Popular Culture and Southeast Asia!”. Open for submission from now until August 31, 2018. For details, please visit the Visual Documentary Project 2018 webpage.